Sometimes, animals can act like total jerks. It doesn’t matter whether it’s two cats having a cat fight or the pet dog that won’t leave you alone when you’re trying to sleep. Animals know how to get on each others nerves, as well as ours. Here are 20 photos of animals who are just being plain mean! Sometimes, cats just know how to be the definition of mean. They’ll fight with each other. They’ll fight with people. And they’ll even do things just to get on your nerves! This orange cat is certainly a good example of meanness in action. 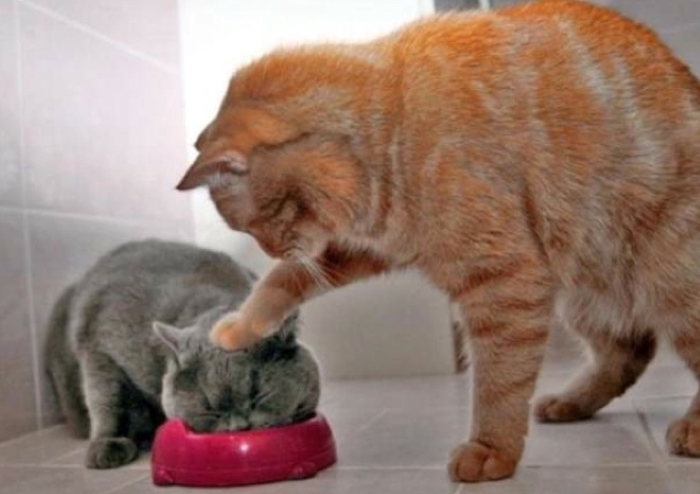 It won’t even let the other cat eat! It’s got its paw pushing the other’s head down in its food. However you look at this scene, it doesn’t look like they’re playing nice. Either way, it left us with a pretty funny picture.